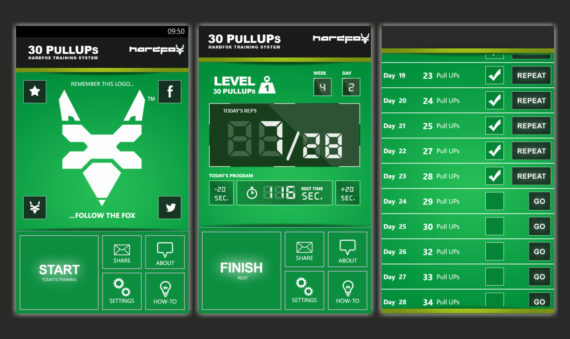 HARDFOX 30 PullUps is an upper body training app. If you are seeking to improve your bicep or back (or both) strength it’s the perfect app for you. Pull ups, although hard, are one of the best exercises you can perform to build strength in your upper body. The are also used to measure your overall level of fitness, because they require a correct strength to weight ratio to perform. When you complete this training program, you will be doing 30 of them in a row! If you can perform just one you can start straight away, but if you struggle with doing the first one (and we know it can be tough, trust us) there are a few exercises you can perform to get you pulling up in no time- inverted rows, lat pulldowns, and iso-eccentric pull ups- google them! Good and old push-ups can help as well (check out HARDFOX 100 PushUps). Good luck!